Cut sirloin into bite size pieces. In a 12 inch Dutch oven, use a full complement of coals on bottom. Place oil in oven, and brown meat on all sides. Add juice, consomme, soy sauce, garlic, and ginger. reduce heat and use 16 coals on bottom and 8 coals on top. Simmer for 1 hour or until meat is tender. Blend cornstarch with water (Use cold so it won't lump). Stir into beef until thickened, stirring constantly. Remove beef and stock to a bowl, and cover. Wipe out Dutch oven and use to cook noodles per instructions on bag. 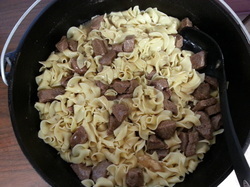 Add beef from bowl and mix well.